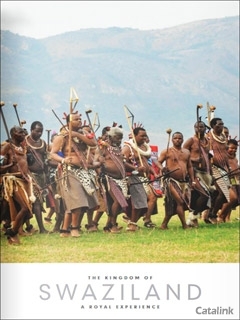 To order a printed copy of the The Kingdom of Swaziland brochure, simply click the Request button below. Swaziland is a tiny country with a big heart and warm, friendly people. As the only absolute monarchy in Africa it embraces and upholds its own unique and ancient traditions which are careful guarded and faithfully celebrated. But traditions and culture are not the only reasons to visit this charming country. Stunning and varied landscapes are to be seen and explored – mountains and valleys, forests and plains. And Swaziland's parks and reserves offer thrilling safaris to see the Big Five, a number of endangered species and truly outstanding birdlife. All of this in a country that can be driven across in a matter of a few hours! 'The Kingdom of Swaziland' brochure is a 52 page guide to Swaziland, with full information on the different attractions the country has to offer, as well details about festivals, wildlife, activities and places to stay. The Kingdom of Swaziland Brochure Paul D. said: I found your brochure informative and easy to understand and would recommend to people. By pressing the Request Printed Brochure button you give consent to The Kingdom of Swaziland (and their Data Processors for the specific purpose of delivering your literature) to send you their Brochure .